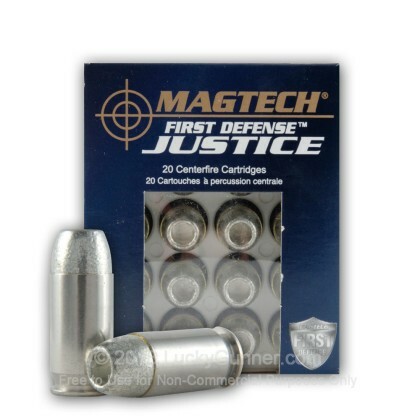 Magtech's First Defense Justice line of ammunition is Magtech's second generation of premium duty ammunition. 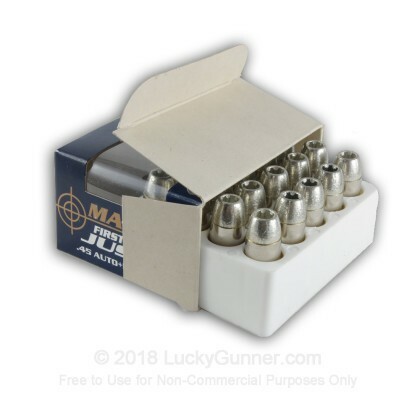 This ammo features a tin coating on the bullet to reduce drag increasing the velocity and energy delivered upon the target. Additionally, this technology reduces wear on the barrel. This ammunition is lead free and the bullet is composed of a solid copper hollow point that retains close to 100% of its weight upon impact. Law enforcement personnel recognize the importance of weight retention for duty rounds as it is the surest way to ensure adequate penetration. Many law enforcement personnel recognize penetration to be the second most important factor behind shot location when it comes to stopping threats. Weight retention is critical to achieving sufficient penetration. This is +P ammo. Please use only in firearms approved to fire +P ammunition. Very good ammo! I had no problems. I have shot about 60 rounds so far and they are very accurate. I noticed the inconsistent appearance in the bullets too. Two out of the box had no beveling. They were smooth. Perhaps better quality control is in order. I'm sure they'll fire just fine but they will not behave like the rest in the box upon impact. 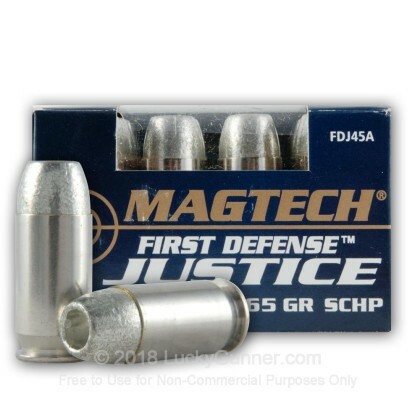 the .45 acp +P "MAGTECH FIRST DEFENSE JUSTICE" are a very reliable round! however...when opening the box containing 20 rounds i noticed that 3 of the rounds werent consistent in appearance with the rest of the case. the majority of the bullets were beveled to give them the +P appearance and effect upon contact with the target. the 3 rounds that didnt look like the rest with no beveling did fire. but why the inconsistant appearance? is it just human error during manufacturing? i want to depend on every round to act the same upon impact.... lets hope the next box has a consistant appearance of bullets. just got my 1st order of ammo from Lucky Gunner, these will be part of next order. this round is quick, destructive and looks awesome too! very cleaan shooting round.